What a day for outdoor-ness! Its is a blistering 29C/85 F here in Brooklyn today. I am looking forward to the first barbeque of well, my life here! Yes, people, I have never done or been to a barbecue in this country (camp fire ones not counted). Not surprising is it. I live in a city, so, no gardens and I don't anyone who has one. You can well imagine how super excited I am about today. Oh, how come, you ask? Well, Brooklyn rocks! Thats all. The apartment has a tiny backyard that is shared between all the residents and we are friendly enough to share I found. Wow, right?! So, before I decide have several people over and have a party and all that, I thought it might be a good idea to, ahem, test drive it and see if I am up to the whole standing in front of searing heat and cooking bit. Fortunately, in keeping with the heat and my lack of experience on the grill, I chose a fish for this first barbecue attempt. I will keep you guys posted on how it goes. In the meantime, I wanted to share a lovely recipe for a light and easy cake that would be perfect for a barbecue or memorial day celebration you may be attending. It is a basic milk cake that is quick to put together and finished itself very fast. It is my version of Tres Leches without too much of the leche fuss. 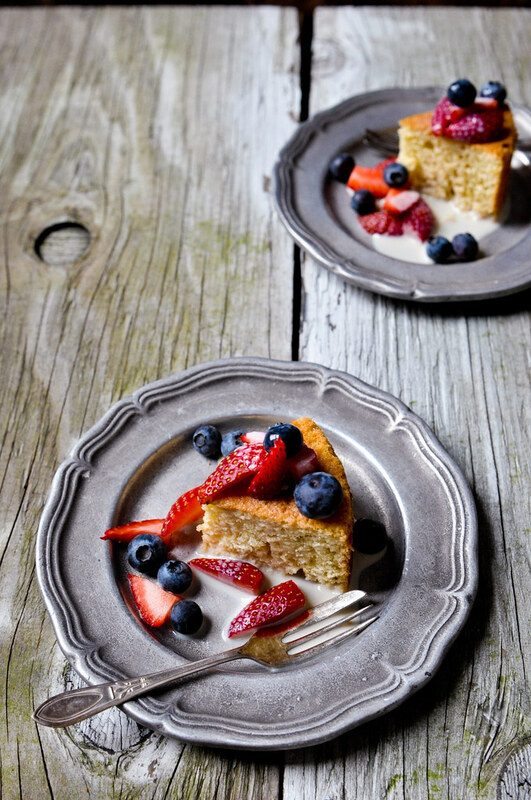 Grab the recipe for my Milk Cake with Berries.